We are happy to announce that Jia Yue has been selected to receive the international Scientific Committee on Solar-Terrestrial Physics (SCOSTEP) Distinguished Young Scientist Award for 2014. This prestigious award is given biannually to young scientists who have achieved considerable success in SCOSTEP science and who took an active part in SCOSTEP events. Quoting from the award letter, Jia was selected “to recognize your contributions on gravity waves that have greatly influenced the improvement in whole atmosphere modeling”. 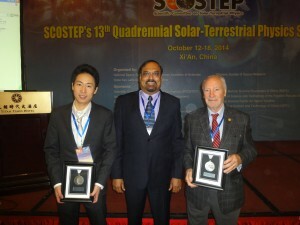 He is the first recipient of this award and will be honored at the thirteenth Solar-Terrestrial Physics Symposium of the Scientific Committee on Solar-Terrestrial Physics (SCOSTEP) to be held in Xi’An, Shanxi, China during October 12-18, 2014.